Why use a PDA member? The Graco EasyMax WPII is a great machine that can do minor touch ups to previously sprayed areas or take on bigger tasks such as doors, skirting, window boards & frames as well as ceilings and walls on smaller rooms. Looking forward to getting started with this incredible piece of kit - 1st job will be to spray my own garage door (in Farrow & Ball external eggshell Lulworth Blue). Wagner XVLP for sale - make me an offer. Has both Standard & Fine pots, all parts as supplied when new including carrying box and strap. Reason for sale - quality of finish when using Bedec primer undercoat was not quite up to my standards. Had worked fine with this product in past, but as a busy decorator I don't have the time to test, etc. Contact Stewart on 07981 226922.
visit http://stewkleydecorating.weebly.com/decorating-tips--info.html or http://www.brewers.co.uk/news When I meet a new client for the first time there will be a discussion about different types of paints, and the majority of people understandably are unaware of the difference in performance - just that an equivalent size tin of trade paint is more expensive than DIY. As with most things you often get what you pay for and there are many good reasons for this (please click on either link above) . As a professional decorator I only consider trade paints as they offer better opacity, coverage and superior performance resulting in a quality finish. When the existing wall colour is not too dissimilar to the new paint then the general finish would be two coats of a trade quality paint, such as Fired Earth, Farrow & Ball, Little Greene, Dulux Trade, Crown Trade etc. The last time I used a DIY paint was in 2009 when a customer insisted I use it as they wouldn't accept that an accurate colour match could be achieved (Crown mixing machines provide excellent matches). So a wall that would have had a great finish with two coats of trade quality paint needed four coats to look satisfactory. Result being extra cost in labour and a finish that would not have the longevity of a trade paint. Finished my job in Stewkley at 4:15, home and changed and arrived in Bletchley at 5pm. Couldn't make their last event when the store opened due to a family birthday, so was determined to finish early to have a worthwhile amount of time there. Been to a previous one in Aylesbury where it started at 7:30am and several demonstrators failed to make the early start, so perhaps Bletchley got it right with a 2 'til 8 event. Karen (Store Manager) and her team had done a great job in maximising the space available and even laid on food and drink, which my son was very grateful for. Spraystore were demonstrating, so I took my Wagner airless along as it had seized on my last job - not good when I'd masked up the whole bedroom ready to spray ceiling and walls. As Graham connected I said I bet it'll work now, and sure enough it did. Great news as I've got several jobs I can use it on this summer/autumn. Problem was that the last product through it was F&B estate emulsion, and the chalky element to this paint can cause it to clog so double the usual amount of cleaning up is required. If you ever consider buying any kind of spray system consult with Graham at Spraystore (Guildford) first, he has a wealth of knowledge, hands-on experience and is a very helpful guy. Beissier were in attendance promoting their Prestonett range of fillers and Aaron (Sales Manager) showed me pre-prepared examples of interior and wood fillers. I'll be using the samples (wood filler comes in a tube for easy application, they're fibre enriched so ideal for small moving joints and come in four shades) to see how they compare. As they're trying to get a foothold in the UK and Toupret are ahead of them in that respect they are cheaper than their french rivals. As a big fan of all things Toupret, I continue to use a lot of their products so it will be interesting to see how good they are. Chris from Bedec, I use several of their products since meeting him at the Paint Show a few years ago, was in attendance (he was a demonstrator at the early Aylesbury event and was there when the doors opened). I also had chats with demonstrators for Toupret (Den) and Zinsser, but didn't even manage to see half of those attending - maybe next time I can finish earlier. Stewkley Decorating have taken the next step to offer customers further choice, by extending the spray equipment available and purchased the Wagner Evo Decorator Airless system. A compact solution for small / medium airless applications. 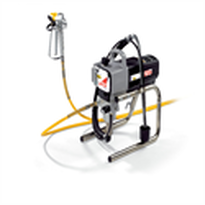 Easy to operate and will spray emulsions, acrylics and smooth masonry paint. The Evo Decorator is robust and is a trade machine. This system will complement my existing hand held machine, and will now enable the spraying of virtually everything in and outside a domestic home, where relevant. Spraying is a faster and higher quality finish than brush or roller, but requires time to mask areas and clean equipment so smaller areas wouldn't be ideal. Labour costs will be reduced when spraying larger areas, for example a hallway with a number of doors over several floors. First day of this years show appeared to be even busier than last year, with few remaining spaces in my usual car park outside the Ricoh Arena in Coventry. My main focus was to see the spray equipment on show, which resulted in the above purchase. Other purchases included frog tape, Purdy brushes, workwear trousers, tack cloths, paint & go plus a few freebies. Video evidence of the X Zero brush releasing a fuller and consistent flow of paint against a leading competitor was impressive. I did try it out for myself briefly and it seemed very good and easy to use. Bristles lost; Pro Dec 26, Purdy 0. This is why it's safer to pay for quality tried and trusted brushes and not pay for any pretenders. There is one more brush to try out, so will it do any better? Kana lost 2 bristles, performed very well and is good value so will be happy to use these along with Purdy, Hamilton, Wooster & Harris. Two years ago, Wagner unveiled the innovative XVLP technology (EXtra Volume Low Pressure) and can now boast further innovation as the FC 3500 is the first hand-held device for professional users! Stewkley Decorating have upgraded their spray system with the Wagner XVLP 3500 - Perfect for repair or renovation projects and for coating surfaces of up to 50 square metres, the device features a very powerful yet lightweight turbine, ensuring a comfortable fit in your hand. The large air volume from the high-performance turbine combined with an innovative nozzle technology provides high-speed spraying and top-quality finishes. Measure Colour accurately every time! The CROMOCON meter gives painters, decorators and interior designers accurate paint references – every time! Don’t waste any more time or money!! See us at The National Painting and Decorating Show, stand 31A. Brewers at Aylesbury are holding their first 'Trade Day' and have trade presentations from Bedec, Rustoleum & Werner. It will be an opportunity to discuss water-based paint technology, specialist paints, stepladders, ladders and access towers, etc. Early start yesterday to get to Luton for 7am, the test run before the official start on Monday 22nd of the Dulux Trade Ultimate Skills tour that is travelling the country for a month. A friendly welcome and introduction from the team led today by Chris who, after showing us the updated Paint Expert app (quite impressive visualizer enables you to colour the room with the Dulux range of 12,000 colours to see how it looks - live! ), took us (me and two other decorators) upstairs to look at various products and finishes on external and internal wood trim. The highlight was of course the new Dulux Trade Quick Drying Gloss and undercoat (a three coat paint system for internal trim - u/coat & 2 x top coats) that is a hybrid between solvent and water-based paint, that stays white longer, with improved flow out properties, has a longer open time (wet edge), plus the high sheen and durability of a gloss. I had a try and it was certainly easy to apply and I look forward to applying some soon - I need to compare some samples to see if there is much difference with BEDEC Aqua (an equivalent product that I have recently been using with great results). Any decorators should register at an event near you and benefit from some expert tips, demonstrations plus a goodie bag with a 1 ltr sample of the gloss and undercoat as well as a Dulux Trade beanie hat & fingerless gloves and pad and pen if you want to takeaway, unfortunately the iPads we used to try out the visualizer have to stay. Sessions are about 45mins. The Ultimate Skills Tour will visit 26 local Dulux Decorator Centre stores between Monday 22nd September and Friday 24th October 2014. Decorating news and views by Stewart C. Fawcett (proprietor of Stewkley Decorating) - maybe a little more interesting than watching paint dry!